(Nanowerk News) Shellfish such as mussels and barnacles secrete very sticky proteins that help them cling to rocks or ship hulls, even underwater. Inspired by these natural adhesives, a team of MIT engineers has designed new materials that could be used to repair ships or help heal wounds and surgical incisions. To create their new waterproof adhesives, the MIT researchers engineered bacteria to produce a hybrid material that incorporates naturally sticky mussel proteins as well as a bacterial protein found in biofilms — slimy layers formed by bacteria growing on a surface. When combined, these proteins form even stronger underwater adhesives than those secreted by mussels. This project, described in the Sept. 21 issue of the journal Nature Nanotechnology ("Strong underwater adhesives made by self-assembling multi-protein nanofibres"), represents a new type of approach that can be exploited to synthesize biological materials with multiple components, using bacteria as tiny factories. “The ultimate goal for us is to set up a platform where we can start building materials that combine multiple different functional domains together and to see if that gives us better materials performance,” says Timothy Lu, an associate professor of biological engineering and electrical engineering and computer science (EECS) and the senior author of the paper. The paper’s lead author is Chao Zhong, a former MIT postdoc who is now at ShanghaiTech University. Other authors are graduate student Thomas Gurry, graduate student Allen Cheng, senior Jordan Downey, postdoc Zhengtao Deng, and Collin Stultz, a professor in EECS. The sticky substance that helps mussels attach to underwater surfaces is made of several proteins known as mussel foot proteins. “A lot of underwater organisms need to be able to stick to things, so they make all sorts of different types of adhesives that you might be able to borrow from,” Lu says. Scientists have previously engineered E. coli bacteria to produce individual mussel foot proteins, but these materials do not capture the complexity of the natural adhesives, Lu says. 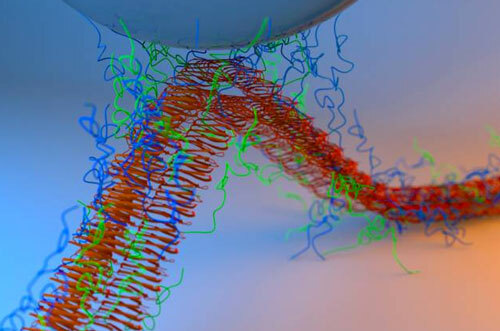 In the new study, the MIT team wanted to engineer bacteria to produce two different foot proteins, combined with bacterial proteins called curli fibers — fibrous proteins that can clump together and assemble themselves into much larger and more complex meshes. Lu’s team engineered bacteria so they would produce proteins consisting of curli fibers bonded to either mussel foot protein 3 or mussel foot protein 5. After purifying these proteins from the bacteria, the researchers let them incubate and form dense, fibrous meshes. The resulting material has a regular yet flexible structure that binds strongly to both dry and wet surfaces. The researchers tested the adhesives using atomic force microscopy, a technique that probes the surface of a sample with a tiny tip. They found that the adhesives bound strongly to tips made of three different materials — silica, gold, and polystyrene. Adhesives assembled from equal amounts of mussel foot protein 3 and mussel foot protein 5 formed stronger adhesives than those with a different ratio, or only one of the two proteins on their own. These adhesives were also stronger than naturally occurring mussel adhesives, and they are the strongest biologically inspired, protein-based underwater adhesives reported to date, the researchers say. Using this technique, the researchers can produce only small amounts of the adhesive, so they are now trying to improve the process and generate larger quantities. They also plan to experiment with adding some of the other mussel foot proteins. “We’re trying to figure out if by adding other mussel foot proteins, we can increase the adhesive strength even more and improve the material’s robustness,” Lu says. The team also plans to try to create “living glues” consisting of films of bacteria that could sense damage to a surface and then repair it by secreting an adhesive.